Long a staple of highly productive, high velocity teams, collaboration has been the focus of many technology solutions over the years. Yet, constant interruptions and multitasking affect productivity, as detailed in the studies highlighted in The Collaboration Curse article in The Economist. The distractions of an environment where teams are encouraged to contribute to everything leave little time for the critical thinking that can make a real difference to an organization’s success. The issue is that many of the so-called collaboration solutions, such as email, Slack, etc., address communication but don’t actually help with the collaborative work. Could this be why your creative teams are throwing on headphones and saying “just stop collaborating with me”? Creatives are inspired by the brief and create multiple versions from the feedback until the assets are approved. Managers provide the creative direction and closely oversee the program to keep it on time, on budget, and focused on delivering the specified business goals. Stakeholders may be additional reviewers or have ultimate approval of the final output. They always need a high-level understanding of how the project fits in with the company’s overall brand and plans. Each of these collaborators relies on the active engagement of the others in a creative process that rarely follows a linear path. It’s never easy, yet it is a key element in producing great creative work. But when the review and approval process happens on a plethora of one-size-fits-all business collaboration tools, it can quickly spin out of control. Creatives are assaulted by random bursts of feedback via their inbox and chat rooms. Managers struggle to keep their teams all on the same page or have to run after the approvers. Stakeholders have no visibility into what’s happening across all the content initiatives without demanding a time-consuming email update or sitting through a mind-numbing status meeting. In that collaboration model, everybody feels overwhelmed and stressed. This leads to lost time, wasted dollars, and, ultimately, lower quality creative output that doesn’t achieve needed business results. As leaders, we need to make nurturing the creativity of our teams a top priority. When collaboration works well, 85% of us say it can be the best part of our days. However, when it’s bad, 56% say it’s the worst . Great collaboration is all about the people – educating them about what works and using a more thoughtful approach to the tools we adopt – to improve the quality and impact of the content produced. Here are my three tips for more stress-free creative collaboration. A creative team struggling to deliver enough quality output jams up your marketing and, consequently, your company’s revenue flow. In a recent survey, 48% of businesses said revenue growth was hurt because they could not deliver quality content fast enough. Just as your nearest airplane exit may be behind you, your bottlenecks may not be in the direction you’re facing. The jams may start with your creative team. Sixty percent of creatives struggle with interpreting feedback from reviewers and more than a quarter say reviews rarely happen. Or does the biggest bottleneck come with distributing approved assets to their channel owners and/or in-market teams. Or does it occur because sales and support teams are not educated on how to best use the new content? Identifying where the true bottlenecks lie is a key first step to unblocking your flow of content and developing stress-free collaboration. With over half of businesses seeing an increase in the number of stakeholders reviewing creative projects, the challenge of getting actionable feedback is growing. 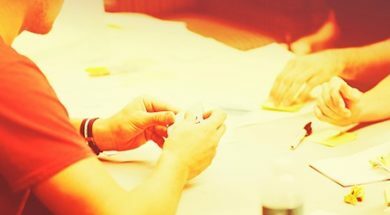 Sales, support, or other departments who may be requesting content may not have had the opportunity to develop that skill of providing clear, actionable feedback. I recently read an interesting post by a video producer who said he needed to train his marketing team on how to give feedback. He asked them to be more precise with their comments (“more emotional … but which emotion?”) by understanding that technical terms may mean different things to a layperson than they do to a video editor. Investing a little time to educate new players in your creative collaboration about how to best give actionable feedback is time well spent. It’s not productive to receive feedback on a creative project alongside miscellaneous topics and distractions found in a typical inbox. It’s worse when the creative receives more comments via Slack and even more by a phone call. Not only does this cacophony create extra work for the creative who has to interpret all this feedback into an actionable revision, it also means there’s no system of record for everyone involved to track changes and progress. Develop a single system for collaboration – let the creative work exist alongside the collected comments and approvals. This keeps the entire team – creatives, managers, and stakeholders – on the same page and avoids costly misunderstandings. Great collaboration depends on trust. Create a trustworthy process where bottlenecks are eliminated, and collaborators know how to offer usable feedback, while working from the same page. Addressing the creative collaboration process through education and more specialized tools will create the proper context to deliver better creative and business results. Want your content team to collaborate successfully? Help them learn the same language by bringing them to Content Marketing World, Sept. 5-8 in Cleveland, Ohio. Special discounts are available for groups. Deborah Holstein has over 15 years in technology marketing leadership roles focused on B2B and B2C SaaS businesses. Currently VP Marketing at Hightail, Deborah has held leadership roles at Yahoo and Cisco as well as launching and growing technology startups including Animoto and Grokker. Skilled in building and leading highly engaged teams, Deborah is an active leadership mentor with Everwise and writes regularly on marketing and leadership topics on Medium, Pulse, MarketingProfs, and Business2Community, as well as her own blog. She holds an M.B.A from New York University in Marketing and Statistics and a B.S. in business from Georgetown University.